Cacao products are sourced both from Peru and Ecuador. 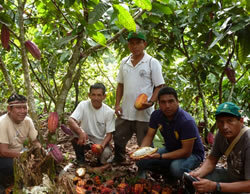 Several groups of organic farmers forming a cooperative cultivate the premium Theobroma Cacao in its native environment. These farmers have received training on how to cultivate the Cacao using only organic farming techniques without the use of pesticides or chemical fertilizers. The beans are extracted from the inside of the Cacao fruit which contains both the beans (seeds) and a white pulp. The beans are separated from the pulp and left to ferment for 5-6 days. After fermentation, the beans go through a drying process below 40oC. The Cacao Beans are then husked and ground to produce Cacao Paste. During this process, part of the Cacao Paste is pressed to separate the Cacao Butter from what is now called the Cacao Cake. The Cake is then pulverized to become Cacao Powder - or pure Raw Cocoa, rich in all the nutrients and aroma of the Theobroma Cacao - Food of the Gods. Check out this report (video) put together by Landline, the popular TV program on the ABC. It highlights how these companies are working together to help poor island communities in the Solomons. These 2 ingredients are our super star sweeteners for our 7 sugar free bars and our A Spoon Full Elixirs. They are both zero GI and therefore diabetic friendly. Check out how Erythritol is made here... and for some more info on it's properties and how it is the sweet antioxident, see this video. 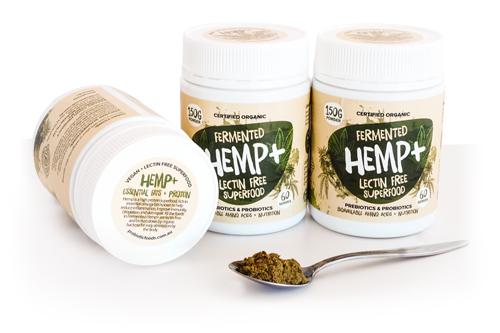 Fermented Hemp+ blend is a selection of 100% certified organic gluten free wholefoods. They have taken nutrient dense hemp protein and seeds along with 8 other vegan foods and fermented them with an organic mother culture. Fermented Hemp+ is rich in a balance of omega, 3, 6 and 9 essential fats, bioavailable amino acids, vitamins and minerals. The fermentation process releases nutrition to the cells in an absorbable form and enriches the balance of good microbes in the gut with a diverse range of beneficial food based bacteria. Check out their website for more information on bush foods and their amazing properties. Don’t forget to check out how they are giving back to community which is what we love the most, check out this video. We source all our tonic herbs and medicinal mushrooms from Willow & Sage Apothecary. They're a business made up of health conscious individuals who are dedicated to helping people achieve their health goals, whatever their journey. Their business is dedicated to sourcing products with integrity. They believe in eating wild foods and working with the spirit of the plants, re-connecting ourselves with nature. All of their herbal ingredients come directly from their original growing source, the pristine high mountain ranges, far from any cities or industrial pollution. Many of thier herbs are wildcrafted directly from the forest, many are "semi wild.” Semi-wild herbs are grown from seed, then placed into a natural environment (a mountain forest or a desert, for example) and allowed to grow naturally without human interference. The "semi-wild" cultivation process simulates the wild mushrooms growing conditions where the herb can accumulate food and energy naturally. This method produces mushrooms with a chemical profile closely similar to the wild material and is often better than the organically cultivated varieties. Wild herbs cannot be termed “organic” because they are not cultivated, even though their growing methods would deem them certified organic.